The sun is a bullet wound in the blue sky’s abdomen. Tanned, tangled limbs cover the bleached beaches in skin and sweat. And there, behind the blur of legs and lost ice cream cones, sits Peter Joseph Gallagher. A self-published author who had reached quasi-mythical status, Gallagher spent years peddling his debut novel, The Little White Trip: A Night in the Pines. Gallagher handed out paperback copies to unsuspecting readers on the Venice Beach boardwalk in Los Angeles. His unorthodox, semi-religious method paid off – earmarked copies got passed around between friends and family. Gallagher achieved cult-like status; an almost impossible feat in today’s day and age. Before we get to the nasty part – yes, it goes downhill from here – let me remind you that this book, this meta-novel written by its eccentric author, should be lauded with accolades and praise. Unfortunately, we’ll never know why Gallagher didn’t follow the traditional route – the man is nowhere to be found on the internet, except for a three-sentence blog post written in 2013. The Little White Trip gained international notoriety when Gallagher decided to sue Joss Whedon and Lionsgate Pictures for an alleged copyright infringement worth $10 million. He claimed that Whedon “stole” his story and used it for the exceptional meta horror film, Cabin in the Woods. The lawsuit was dismissed and Gallagher left the courthouse empty-handed and even more infamous than before. I refuse to get involved with the semantics of the court case – this is a book review, not a philosophical “what if” essay. So, let’s ignore the chaos of the lawsuit and focus on The Little White Trip. The metafictional novel piques one’s interest immediately with its double entendre title. 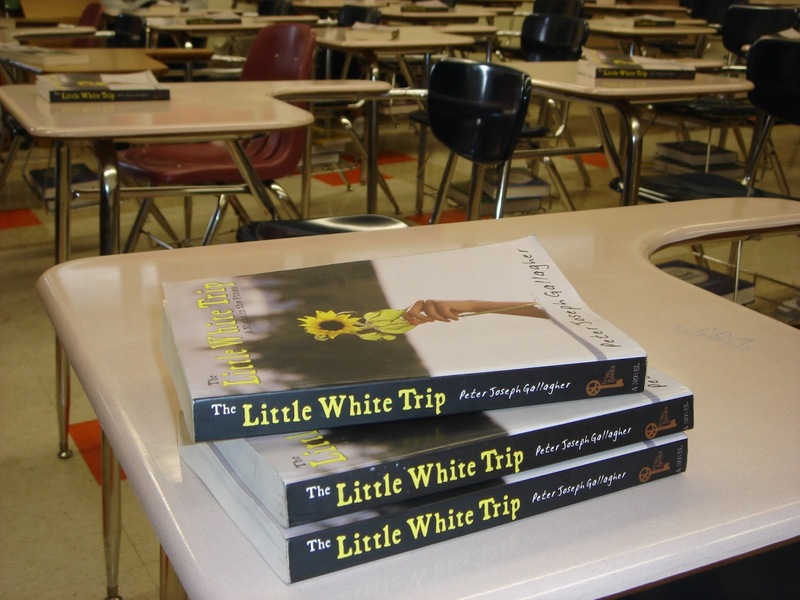 The Little White Trip, emphasis on “trip”, alludes to both a literal and figurative “trip” – the characters are binge-drinking, weed-smoking teenagers. Their “trip” evolves into a nightmarish slasher-flick, which not only trips them out, but also ends their adventurous graduation weekend prematurely. The main protagonist, Matt Thomas, begins the story by telling the reader directly about his involvement in the literal novel. Peter Gallagher, the actual author, becomes a character in his own book. Before your brain fries with all of this Inception babble, I need to clarify something: one is consciously aware of the metafictional content, yet there’s a strange cognitive dissonance that takes place – the book forces you to reread the opening before and after you finish the novel. Without giving away the plot twist, all I can say is that the book launches itself at you like a rogue nuclear missile. It’s visceral and chaotic and philosophical. You question your own reality within the exquisitely written chapters. The Little White Trip doesn’t unfold in the traditional sense – it kicks you in the throat and leaves you gasping for air in the burn cold snow. Yes, it’s polarizing and yes, it’s definitely bizarre (not House of Leaves bizarre – don’t stress). Peter Gallagher demands one’s attention at all times. He doesn’t let up. My top four favourite books of all time include The Metamorphosis by Franz Kafka, Orlando by Virginia Woolf, Battle Royale by Japanese writer Koushun Takami, and Ulysses by James Joyce. I can finally add a fifth book to this list. Say what you will, but The Little White Trip is one of the most important, self-referential works of fiction I have ever come across. I read the novel twice in a matter of hours. Although swift, my second reading gave me the opportunity to search for signs and clues which could subtly explain the final, teeth-cracking plot twist. It might have been a case of hindsight bias, but during my second reading I noticed little nuances here and there and somewhere in between. They popped out like zits on a sweaty face – I actually gasped when I noticed the plasticity and inherent ambiguity hidden in the prose. The Little White Trip is worthy of recognition. Some critics have lambasted Gallagher’s incredible twist, while others gave him the fortunate benefit of the doubt. I tend to agree with the latter. My reasoning? Well, a plot twist cheapens over time. The evolution and eventual devolution of 80’s slasher movies is a prime example. What is now viewed as cheesy and ironic, was once viewed as terrifying and absolute. The horror genre developed over the years, with writers adding more and more ludicrous twists to an already bent narrative. Originality is subjective. And fear is an automated, individual response. The book is available on Scribd; Matt Thomas is credited with the upload. Matt Thomas – the main protagonist.